Wrap up your love of food and your love of Disney in one place. 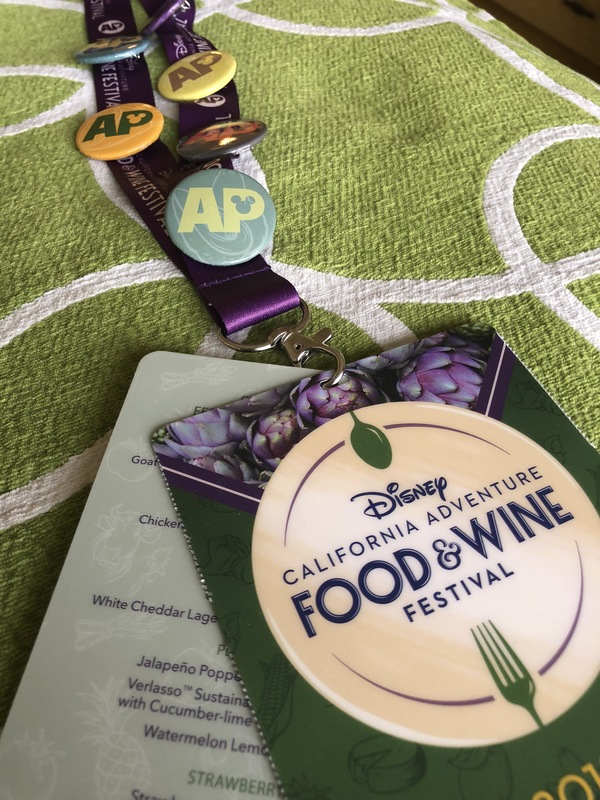 The Disney California Adventure Food & Wine Festival is a Disney foodie dream. After another day of feasting on the yummy dishes being offered this year, I’m stuffed…AGAIN! And there are even more options than EVER! Fourteen different stands offer a wide variety of food types, drink pairings, and sweet treats. And that’s just the food. Like in years past, there is entertainment, demonstrations, and signature events. As for souvenirs, there are pins, gift cards, glasses, aprons, shirts, and other goodies. But the real star – as always – is the food. The average price for a dish has stayed about the same as previous years at around $7. Considering the quantity you get for your dollar, it’s a bit pricey, but you definitely get your fill after about 3 or 4 of these yummy dishes. The bigger problem is a lack of stomach space for the volume you’ll want to eat. With so many plates to choose from, it’s tough to narrow it down. The stands are located primarily along the walkway leading to Pixar Pier and culminates at Paradise Gardens. There are three stands off the beaten path over in Hollywood Land as well as AP Corner – a place for Annual Passholders to hang out, take character pics and get a free button. We tried six different plates – all of them but one were very good. The only one that wasn’t worth the price was the Crispy Orange Chicken & Rice with Garlic Cracker at the Citrus Grove stand. The chicken wasn’t coated well and was a little too crispy but I was impressed with the actual mandarin oranges on the plate. Good but not great. We tried the Salt & Beer Vinegar Parmesan Chicken Wings from Cluck-A-Doodle-Moo (love that name). I really enjoyed them, but Emma thought they were only okay. These are not hot wings, but tender Parmesan wings cooked perfectly. We also tried the Bourbon Chocolate Whoopie Pie from I (heart) Artichokes. It was good, moist, and much more cake like. It wasn’t overwhelmingly sweet and was nice complement to everything we already had but not a sweet that necessarily stood out. It was still very good. We went to Garlic Kissed and tried the Creamy Mac & Cheese with Garlic Bread Crumble. Really nice mac and cheese and I liked the garlic bread crumble. A nice touch. But it wasn’t the best mac and cheese of the day. That title goes to Emma’s favorite – Jalapeno Popper Mac & Cheese with Bacon! Just a well-balanced dish with just the right blend of heat and bacon goodness. The mac and cheese was nicely balanced with the jalapeno popper topping. Yum. We both agreed our second favorite was the Spiced Oumph! on Pita with Avocado Hummus and Garlic Sauce from Avocado Time. I don’t even know what Oumph! is but it tastes like marinated chicken and was REALLY good. My favorite was from Garlic Kissed – Black Garlic Soy-braised Pork Belly Banh Mi. Just SO smooth and delicious. I don’t know who at Disney does the pork belly recipes but every single time, they are the best! If you’re a Disney foodie, you must try the samplings at the Food and Wine Festival. If you’re an Annual Passholder, I would highly recommend the Sip and Savor Pass (which you can purchase at multiple locations along the route). If you use it for main dishes only it is definitely worth the price. And you don’t have to use it all in one day. You can spread it over multiple visits. Plus you receive a cute little pin with each purchase. Overall, the Food and Wine Festival is another hit and definitely worth a visit. The convenience of snacking all day between attractions is also appealing. Have fun and let us know what your favorites are!